From dressing themselves, to eating breakfast, meeting new friends, counting, playing and even home time, My First Day at School takes youngsters through fairly typical things that happen on the first day of school. The use of a range of animal characters adds humour and interest. The character on the spread with the line “I dress myself”, for example, is a centipede, sporting brightly patterned socks on each of its numerous feet. Other spreads feature rabbits, dogs, owls, a rhino and more. This use of the animal characters to illustrate what is very simple text does not remove it too far from children’s experience and the use of both familiar and less familiar animals – including a sloth, a puffin and a tapir (?) – creates room for discussion both about what is happening at school and about the animals themselves. 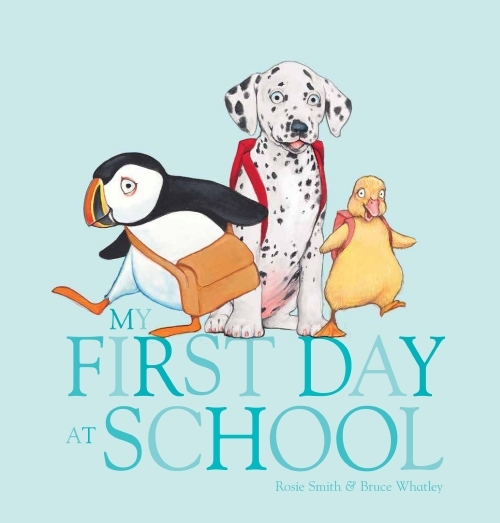 Perfect for a young child starting school, My First Day at School is a treasure from one of Australia’s bets loved creative teams in Bruce Whatley and Rosie Smith.